You may not know it, but the most important pieces you’ll ever design for your clothing line won’t be shirts or pants- it will be the labels. Different clothing labels serve different purposes, each one helping to enhance your line’s attributes and make it stand out from the crowd. This is especially true for hang tag labels, which are the most distinguishable label on any garment. Shoppers inspect a garment from A-Z, looking for any hidden clues about its quality and worth, which is why everything, from the stitching to the labels, need to be perfect. It’s also why a premium hang tag label should be at the top of your must-have’s list. They are the first label a shopper sees and can instantly make or break a sale, so they need to be impeccably designed, sending a clear message that imparts your brands style and product information. Here at Sun Tat we can provide you with unique hang tags that will set your collection apart from the competition. We are industry leaders when it comes to creating startling, quality hang tags that leave an impression on buyers, using the latest techniques and materials. Leather, canvas and foil stamped tags with silk ribbons or twine are just a few of our offerings- whatever you imagine we can make happen. And if you need help coming up with the ideal tag, our design and graphics team can help you with that too. That’s because Sun Tat is committed to being the best, so we can provide you, and your customers with the best. We give our customers 1000%, so they can do the same for theirs. Hang tag labels are your brand’s ambassador, saying everything you can’t and speaking to all your potential customers. A good hang tag grabs a shopper’s attention, gives them pertinent information and reflects your brands quality, making it the most important piece in your collection. Embossed with a logo and even a tag line- you can really get your message out and bring customers in. Designed to be stand-alone labels, hang tags are your customer’s go to. They are usually attached on a garment’s sleeve or pant belt loop, so shoppers can easily spot and grab them. While they are usually removed once a garment is bought, their temporary function in no way diminishes their impact or importance and should be designed just as meticulously as the garments they adorn. As they are frequently handled, materials are important: you don’t want them to wear or fray over time, giving your line a worn and lesser-quality look. You want them to stand out and stand-up, making them a bit different from other labels. Imprinted with your company’s logo and basic product information, they can be created using varying materials, from no-nonsense canvas to quality leathers, and can speak volumes before a shopper ever tries a garment on. They can also be attached using a number of materials, like nylons and silks, to give shoppers an instant impression. The attachments also help you attach them virtually anywhere and also gives you a safe way to make it a part of the garment without damaging it. You only have one chance to make a good first impression- and your hang tag increases your chances from maybe to definitely. Hang tag labels are essential to getting your brand noticed and creating a loyal customer base. Having a flimsy label, or one that is boring in terms of colors and shapes, will turn shoppers away. Shoppers want a label that feels substantial in their hand and is pleasing to look at: it tells them the item is worth their attention and built to last. 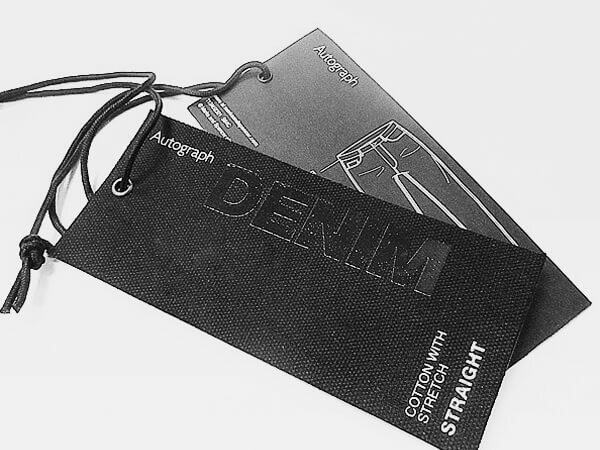 Hang tags also serve a real purpose: when a shopper grabs it, they get instant information, such as sizing and materials. It is made to make shopping easy and convenient– leave off the important information and customers will look elsewhere. No one wants to go through the hassle of looking inside a garment for sizing info, especially when the garments next to it have it clearly displayed. Designers can really customize the look and feel of the label, giving them a prime opportunity to reel in customers from their first glance. Using a catchy slogan, you can really impart your personality on them and have fun, which resonates with buyers. Using bright colors or bold shapes, like a sun, will lure customers over and also make your collection instantly recognizable: a big plus in the very competitive retail world. These labels show shoppers you pay attention to every detail, a sure sign your collection is well-made and worth their time and money. Paper Hang Tags: Paper labels come in a variety of card stocks, for varying thicknesses and are versatile in terms of colors and printing techniques. Standard stock is 18-point, about twice as thick as a business card, for a firm label that can take any design or print. There are heavier stock options, up to 64-point, for a longer-lasting option, as well as distressed, recycled and sheer paper choices, for one-of-a-kind styling. Paper labels can use die cuts, various inks (including metallic), foil-stamps, UV printing, embossing and more, for intricate details and designs. They can be attached with waxed string, elastic, or ribbon, depending on thickness. Heavier stocks look really nice with grommets or metal eyelet for a finished, polished look. Great for custom prints, standard 18-point works best on tees and other light fabrics. 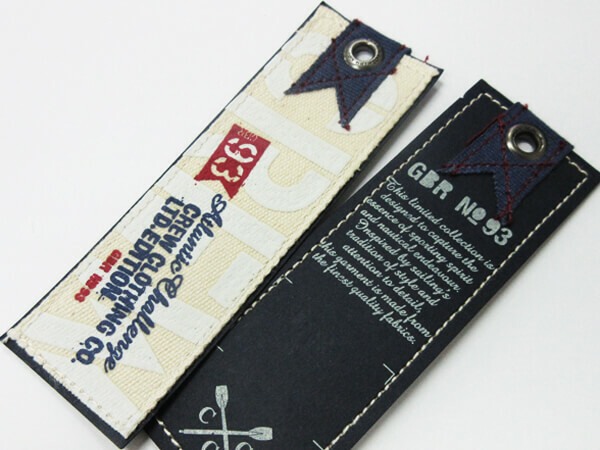 Leather Hang Tag: Leather hang tags are the strongest you can get and also the most sophisticated looking. The can be embossed, hot pressed, embroidered or printed on for a wide range of looks and lend an air of sophistication to your line. These tags can be made with real or faux leather and are limited to blacks, browns and tans for backgrounds. There is also a smaller selection of printing colors, making them a smart fit for high-end collections or simple, elegant logos. 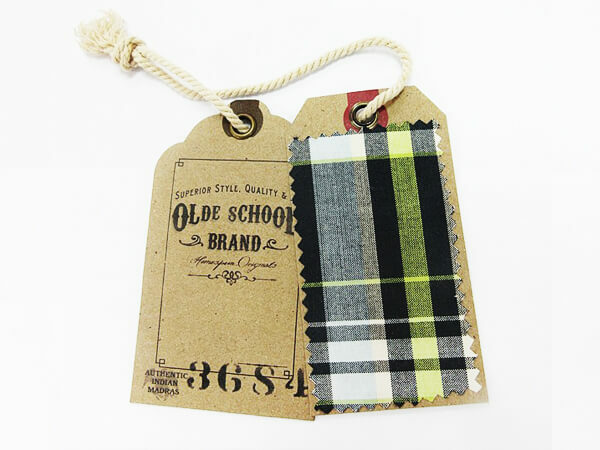 Canvas Hang Tags: Canvas, or cotton hang tags are a good choice in terms of durability, as they won’t tear or bend like paper can. They have a soft, supple feel and pair best with like materials, making them great for tees, jeans and baby clothing. 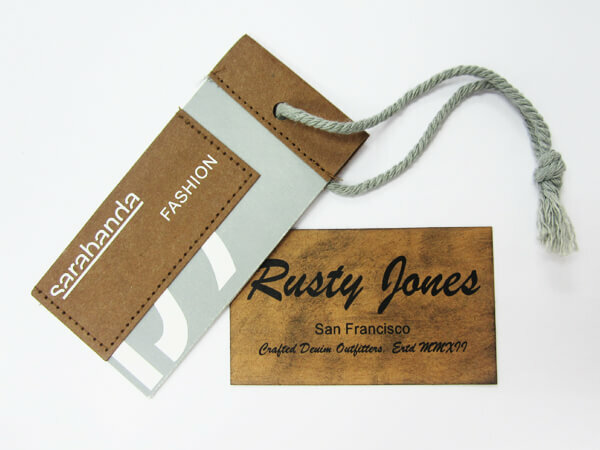 Cotton hang tags are all natural, a plus for environmentally conscious lines and while they are limited to neutrals for background colors, they can be printed on using just about any other color. They work well with a stylish copper eyelet and twine or string attachments. UV Print: UV printing can work on paper or canvas, using ultra violet lights to fry the ink into the material. UV printing allows you to create brighter colors and offers precision detailing and printing. Works great for elaborate designs and slogan displays. Foil Stamp: the foil stamp technique is great for adding a dazzling, sparkling shine to your tags. Using a thin metal film and foil dye, it is printed onto paper tags for striking images that draw the eye to the product. Best used on paper, it works well for large logos and collections of all price ranges. Sun Tat is dedicated to providing you with the highest-quality Hang Tag Labels you can find for your clothing line. You deserve nothing less than perfection, and we will give it to you. Just as your labels are your garment voice, we are yours and will make sure your vision becomes reality. View our work to see all we can offer and please contact us with any questions. Whatever you need, we can give you.